This is Part Four of an Optimistic Look at the 2007 Pittsburgh Pirates. Today’s section features Adam LaRoche. Keep in mind that these are not my realistic predictions for these players. This is a best-case scenario, something for the hopeful fan to dream about as we approach the upcoming season. Adam LaRoche hits a baseball extremely hard. Adam LaRoche was the most prized acquisition for Dave Littlefield and the Pirates this offseason. He is coming off a career season in which he went .285/.354/.561 with 32 homeruns. 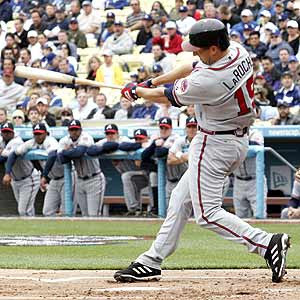 LaRoche started slowly in 2006, hitting .251/.325/.479 with 13 homeruns before the All-Star break. However, he was phenomenal in the second half, with a line of .323/.387/.655 and 19 homeruns. There are a few different theories on what caused this dramatic turn around. One focuses on the fact that he began taking medication for Attention Deficit Disorder, a condition he has struggled with since high school. Even LaRoche himself, who generally prefers to keep his symptoms and play on the field separate, has admitted that he has felt a greater ability to focus at the plate since beginning treatment. Another belief is that LaRoche simply needed a regular spot in the lineup to become comfortable. He had spent much of his career starting only against right-handed pitchers, mostly because of his anemic numbers against lefties. However, once given the full-time first base job during the 2006 season, he flourished. He improved greatly against left-handers, with a respectable OPS of .797.